This recipe spins the web for a longtime. If you are a foodie , you might have tried this one. If not it is not too late. The bread doesn't require any special baker skills. No worry of killing yeast, no need of power muscles to knead the dough- that doesn't sounds great for any newbie to kick start a bread? The bread is not baked in constraint of time. Barely, we mix three main ingredients and forget it for hours at room temperature. The dough turns into a nice bubbly look (gluten formation). You drop (literally runny dough) the dough in very floured surface and fold it like a business letter format and fold again the same way. Let it rest another few minutes and try to shape it like a ball (If you can u should be real pro). Let it give a rest and bake in hot sizzling casserole. Got to tell, you will be surprised without a sweat you succeeded to bake an artisan bread! The bread came out with a perfect crispy crust, and soft and chewy inside. The entire process is incredibly simple and the innovator of this recipe is Jim Lahey. The only thing you need is patience and 24 hours to bake this bread. I watched his video and saw the recipe, there is a difference in measurement and oven temperature in both. I used 1 1/2 cup + 1 tbsp water and 450 Degree oven temperature. 1.In a bowl, mix AP flour + yeast + salt. Now add 1 1/2 cup + 1 tbsp water (Tap water) and stir until blended. The dough will be very sticky quiet like thick paste. Transfer into a glass bowl smear with oil.. Cover with plastic wrap and let it rest at least 12 hours . My dough rested for 15 hours. The dough is ready when u see a bubbly top. 2.Sprinkle flour on the working surface, drop the dough keep your hands well floured too. Sprinkle some flour on the dough and fold like business letter form and fold again the same way. Cover loosely with wrap and let it rest another 15 minutes. 3.Sprinkle cornmeal/flour or wheat germ in cotton towel. Shape quickly the dough into ball. Put the seam side down and cover the towel loosely and cover with another towel. Let it rise another 2 hours the ball will double in size. At least 30 minutes before the dough is ready, heat the oven at 450 Degree. Keep the casserole with lid in oven and heat for 30 minutes. When the dough is ready , slide your hands under the dough (will be like a big jelly ball) turn the dough seam side up in hot pot. If it looks messy give a shake once or twice, it will straighten while baking. But I chose a very small casserole, that is why the dough shrank. Close with lid. Bake 30 minutes with lid and remove lid and bake another 10 to 15 minutes until u get a golden crust. Remove and cool completely in wire rack before slicing. Made a slideshow you can check out those steps. Sending this bread to "Only-Cooking with bread" by Pari. Bread baking is the best smell! Looks good! I love that book and your bread just look so so good actually perfect. Bread looks absolutely prefect...feel like having some slices with some jam or nutella spread..
this is so interesting. I am always a little scared of baking but desire to come out of the shell soon. Your bread reminds of the fresh bakery store we used to stop at whenever we visited Kerala during summer vacations. Very inspiring!! What a Coincident..I also made this bread yesterday :)) But I think yours is better than mine..yours came out superb!!! 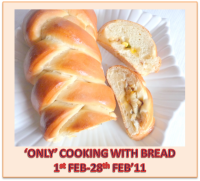 I am an absolute bread lover n it is always great to learn new ways of making them..looks splendid! Off with kneading & punching! Would love to patronize this recipe for my bread making henceforth. Thanks for the slide show, Cham. wow looks so perfect cham!..great job..one day I will try this..
A very simple bread to make. Looks great. its been so long since i baked bread,..this one looks so dleiicous,..
Loaf looks very nice,amazing recipe! Bread looks soft n yummy ..bookmarked it dear.. Bread looks perfect and delicious with some butter. To date, it is still one of my favourite breads to make. Your bread look well risen and perfect.I love that picture with butter knife. Bread has come out perfect! Good one Cham. Look awesome' wonderful clicks...thanks for sharing the recipe. I run away if anyone talks abt bread...Ur bread luks perfect to try this recipe..great job,cham..
Great looking loaf you have there!! That looks beyond delicious, Cham. And no-knead too. Wow! I've read about this recipe for a really long time but could never try it since I had to casserole. But that has been rectified, so thank you for reminding me, the loaf looks perfect. This is my favorite bread to bake, even if it takes that long. Mostly because there to almost nothing to do here, and you get the best air holes and the crust. yours have perfect air gaps! Looks so simple yet perfect.. Thanks for the recipe..